Imagine having the option of drastically reducing OR eliminating your gas or electric heating bills this season. Imagine having supplemental heat to use at your discretion. Imagine having even temperatures throughout your home without cold spots. An Acucraft high tech wood burning fireplace with our whole home heating system makes this possible. No, we’re not talking about an unattractive outdoor wood burning furnace. You know, the kind where you’ve got to pile on a dozen layers of clothes and face the elements to stoke the fire. We’re talking about an Acucraft high tech wood burning fireplace that is both functional and makes a beautiful focal point within your home. Plus, tan outdoor wood burning furnace is less efficient and consumes twice as much wood—it’s like taking on a second job to stay warm! There are lots of reasons to choose an Acucraft high tech wood burning fireplace for your home, like memories made around a crackling fire. Conversation with family and friends. The dancing flames and the wood burning smell on a cool, crisp evening. Plus the fire warms your homes and your hearts. Adding to all this multi-sensory enjoyment is the added cost savings of whole home heating. All it takes is adding a few affordable attachments such as remote ducting/502 CFM in-line blower, and a water loop to your Acucraft high tech wood burning fireplace for warm air and hot water. The Acucraft High Tech Chalet and Great Room Fireplaces include a standard 465 CFM blower and 14 tube heat exchanger. Contact a knowledgeable Acucraft Fireplace Advisor for details. A beautiful and functional focal point. This Acucraft custom high tech wood burning fireplace is going on 13 years as a whole home heating solution for Kim and her family who live on the San Francisco coast. Acucraft has been designing and handcrafting highly efficient wood burning fireplaces for over 39 years. In fact, Acucraft got its start during the energy crisis in the 1970’s. That’s when our founder, Roger Hansen, engineered a wood burning whole home heating solution to offset electric and gas heating costs…and thus our High Tech Chalet fireplace was born. Back in the 1970s, many homes were built with an open-faced masonry fireplace. These units were only -30% to 10% efficient. Why? Because they robbed warm air from within the home and sucked it out the chimney! Heated room air continues to be drawn up and out the flue for up to a day after the fire goes out. Even today, many wood burning fireplaces are still inefficiently taking your warm indoor air and sending it up and out your flue system—but not Acucraft’s fireplaces. Our founder put an end to that. 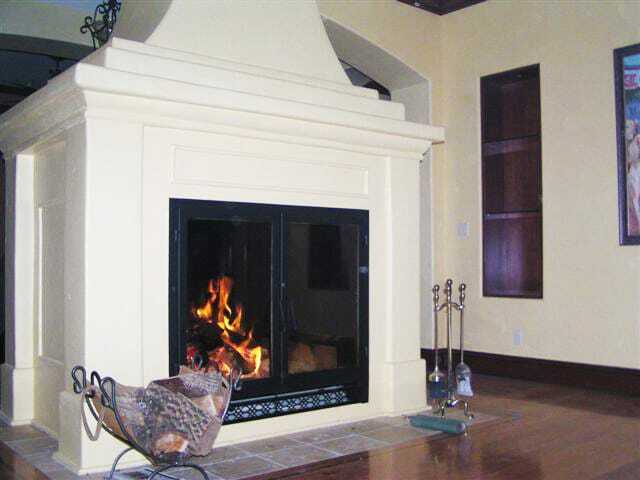 Hansen engineered a wood burning fireplace system that was 60% more efficient. Even the smallest Acucraft High Tech Z-MAX wood burning fireplace efficiently heats up to 3,000 square feet and generates 130,000 BTU’s an hour—that’s more than the average furnace which generates around 100,000 BTU’s an hour. The largest Acucraft High Tech Great Room wood burning fireplace efficiently heats up to 4,000 square feet and generates 180,000 BTU’s an hour. So Acucraft wood-burning fireplaces crank out a lot of heat! An Acucraft wood burning whole home heating system is a great way to maximize your fireplace’s heating potential! With the use of remote ducting and a water loop, you can heat your air and your water with your high tech wood burning fireplace! These options are inexpensive to install and they offer a huge return. 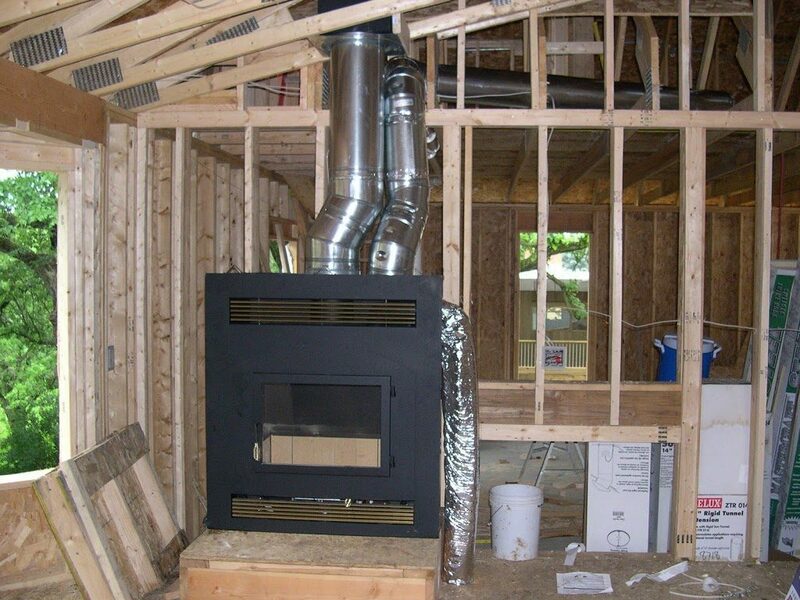 2) A remote ducting system to transfer the warm fireplace air through your furnace duct system to evenly distribute the fireplace heated air to all areas within your home. 3) For heating your domestic water, an Acucraft stainless-steel Water Loop is installed which may also be used to provide radiant in-floor heating or be tied into a hydronic heating system. A small pump, controlled through a thermostat, circulates the water when your firebox becomes heated, and provides supplemental heat for your water. Both the in-line blower for Whole Home Heating and the pump for the Water Loop can be connected to a thermostat mounted below the firebox, so when your firebox heats up it automatically turns on your in-line blower and water pump. Many Acucraft high tech wood burning fireplace customers who have installed these options have dramatically reduced or eliminated their gas and electric bills during cold weather season. The Acucraft High Tech Chalet and Great Room Fireplaces include a standard 465 CFM blower and 14 tube heat exchanger. Contact a knowledgeable Acucraft Fireplace Advisor for details. The Acucraft wood burning fireplace whole home heating system: Remote ducting transports fireplace heat to the furnace ducts for distribution throughout the home and the water loop heats domestic water. The unfinished Acucraft High Tech Z-MAX Wood Fireplace shows the remote ducting, the 8″ duct on the right of the fireplace flue, transferring the heat from the fireplace to other areas of the home. Also installed is an in-line blower with variable speed to control the amount of heat transferred. When finished, these items will be hidden. The Acucraft stainless steel water loop is factory installed into the fireplace that can be used to heat your domestic water and/or your radiant in floor heating systems. A small thermostatically controlled pump is installed that will automatically start circulating the water when your firebox becomes heated and provide supplemental heat for your water. Whether you’re looking to heat your home in the winter or want to add more warmth on cold nights, Acucraft’s High Tech Wood Burning Fireplace Whole Home Heating Solutions are great for all homeowners! 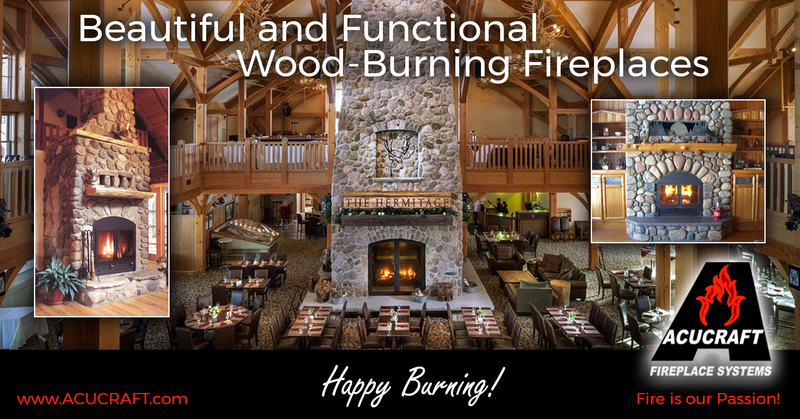 Acucraft has been designing and handcrafting wood-burning fireplaces for 39 years. We listen to your ideas and produce the fireplace of your dreams for a lifetime of happy burning. Contact one of our knowledgeable Acucraft Fireplace Advisors today to get started on your dream fireplace!